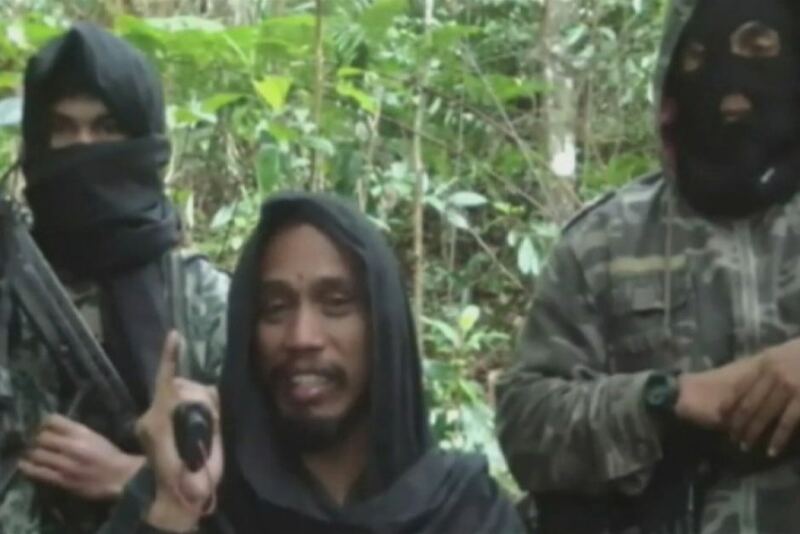 Eager to be seen: Indonesia’s most wanted terrorist leader, known as Santoso, has shown his face in a six-minute video posted online. Until now Santoso has only been seen in a few grainy pictures. But he clearly shows his face in the new video, which appears to be professionally produced, with rousing music and layered graphic effects. He is flanked by men, holds a gun and proudly celebrates killing in the name of God, calling for more people to martyr themselves. Santoso has been linked to a number of attacks and is part of a group called the Indonesian Mujahidin. The group operates from the jungle around a terrorist stronghold called Poso, from where the video appears to be shot. The monologue by Santoso mainly focuses on encouraging his followers to keep killing members of the police anti-terrorism squad Detachment 88. “I am proud, I am impressed by your courage, like a lion jumping on his prey, to tear the prey apart,” he said. Police have become the number one enemy of Indonesian terrorists since the break-up of a training camp in the Aceh jungle in 2010. Santoso hails the revenge attacks that have been meted out since then, including the killing of at least six police members. “Detachment 88 is the real enemy, the real Satan,” he says in the video. “When you face the fight against Detachment 88, you need to be in spirit, you need to be strong, you need to be brave as has been shown proven by previous Islamic heroes in history. But authorities are hitting back. In recent years Detachment 88 has shut down scores of small cells, and thwarted dozens of attacks. Rather than a sign that the Indonesian Mujahidin are likely to get more organised or powerful, the video will most likely be seen as sabre-rattling. Others see it as an attempt by Santoso to recruit members and boost his own brand among terrorists. This entry was posted in Uncategorized and tagged Central Intelligence Agency, Egyptian Islamic Jihad, HOME LAND SECURITY, National Counterterrorism Centre, Open source intelligence, Qaedat al Jihad. Bookmark the permalink.